A good way to embellish an article of clothing, a baby blanket or cloth is to crochet the edges. Crocheting an edge is an easy fun craft to do; it will transform any item into something new. Examine the item to see if it has any sewn edging. Baby blankets and some clothing items will have a thread border. Crochet or knitted items are also easy to add onto without creating a border. If your item has no thread border, you need to create one. 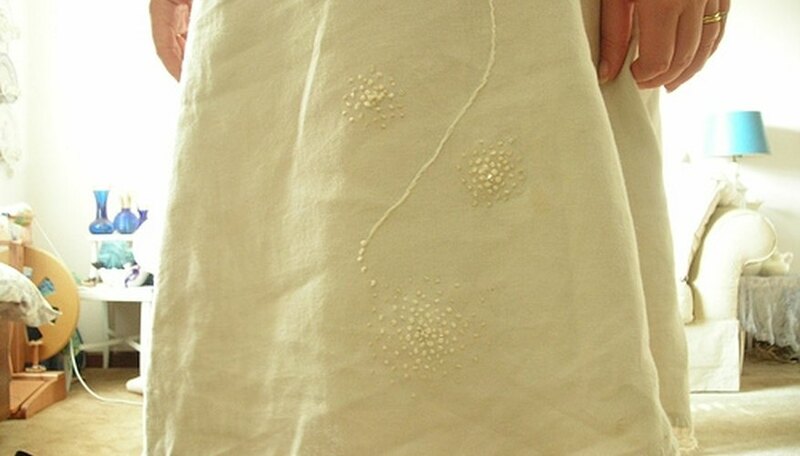 This is done by sewing simple stitch around the edge of the fabric that you want to crochet. It should be loose enough to push the crochet hook through, but not so loose that the crocheted edge hangs loosely from the item. Choose a starting point on the item and push the hook through the first loop or hole. Create a single crochet with this stitch. Then, reaching into the next loop or hole, create a second single crochet. Repeat this process all the way around the item. When you have completed one full layer around the item, you can grow your edging by adding more rows and more fancy stitches the way you would add length to any crocheted object. Just keep crocheting! If you feel unsure about your crochet skills, try fuzzy yarn as it hides minor imperfections. Don't be afraid about making a mistake. A crochet edge can always be removed without any damage to the original item.